GLOBAL: Mobile and associated opportunities around voice and image are driving growth in search advertising according to a new WARC report. 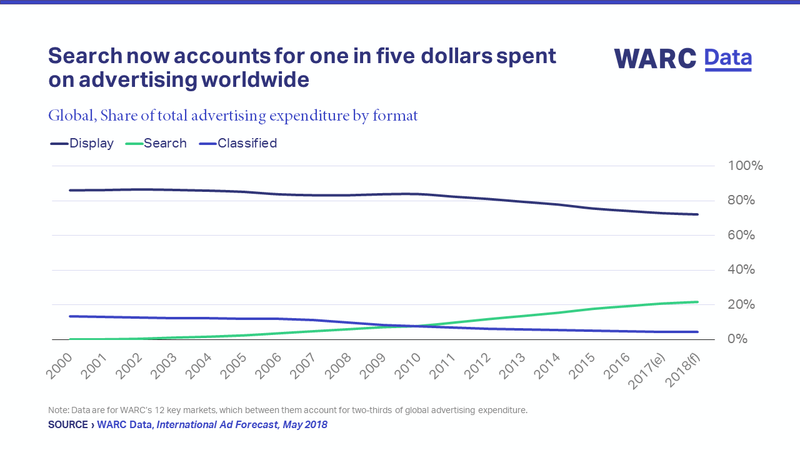 The latest monthly Global Ad Trends report focuses on search advertising in WARC’s 12 key markets and forecasts growth of 11% in 2018 to reach $100.5bn – or one in five of all dollars spent on advertising worldwide. Mobile search is expected to attract $62.7bn, or 62.4% of total search spend; mobile’s share of total search spend has almost doubled since 2015, driving wider sector growth. The report notes that, among people using voice tech at least once a week, the top six activities are search related, including online searches (60% of users), finding information on a product (53%), asking questions (50%), asking for directions (42%) and finding information on a brand or company (41%). Further, neurological research shows that when people ask a question involving a brand name, their brain activity demonstrates a significantly stronger emotional response compared to people typing that same brand question – emphasising the need for brands to craft the sound of their own voices. Image search is also gaining momentum, with half (51%) of UK millennials having used the feature, while almost a fifth (17.6%) already do so regularly. Households with children also demonstrate similar adoption levels to millennials. But, says the report, brands looking to advertise against visual search queries may have to wait some time before digital platforms advance inventory beyond basic text-style search terms. Elsewhere, data for April show that 89.3% of mobile users prefer Google's search service. Google's market share dips closer to two-thirds (66.8%) in the more mature desktop market, where Baidu controls a fifth (20.5%), Bing takes 7.7%, Yahoo 3.5% and others 1.5%. The report also finds that click through and conversion rates for search ads outperform online display across 16 product categories, though costs are often higher as a result. This report summarises the latest research from WARC's Data platform, with a focus on search advertising. An overview of click through and conversion rates by ad format and product vertical.